"Wrestle well, take the lance, spear, sword and Messer with manly courage. Strike hard! Rush in: meet your opponent or let him pass by, so that the wise may hate the one who is seen to be hemmed in"
The weapon types, or disciplines as we refer to them, taught within the SMEF are limited to those used in the known western world during the high medieval period. This extends from C13th to C15th, and in addition to our primary weapon, the longsword, other disciplines includes arming or short sword, sword and buckler, dagger, polearms (quarter/half staff, spear), messer, and any additional disciplines the instructors believe beneficial and appropriate. We are not against trying later weapon types, e.g. rapier, backsword, smallsword or pugilism, but these are very much additional to rather than the mainstay of the school syllabus. The late medieval German longsword evolved from a rudimentary weapon into a finely-balanced tool with certain characteristics that occur as a consequence of its proportions and balance and so complement the Liechtenauer style. 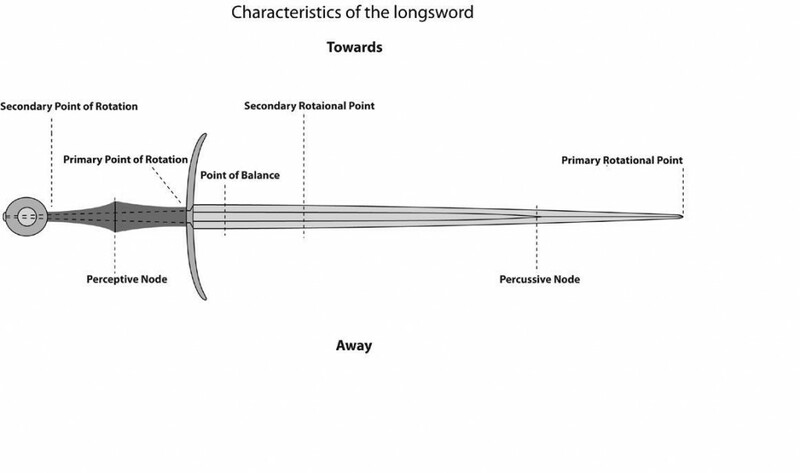 The 'Characteristics of the Longsword' diagram below demonstrates the complexity of the weapon and how important it is that the proportions are correct with regards to the sword length and blade profile, the most important elements being how the sword's primary point of rotation relates to the natural harmonic of its mass and how the percussive node relates to the resonant frequency of the blade profile. If these two elements are correct then the primary rotational point of the blade will be found about the tip and the perceptive node will be found in the centre of the grip. How to discover these characteristics can be found in the book: 'The Art and Science of Johannes Liechtenauer's Medieval German Longsword. Grades 1&2' by Chris Stride. Weapon simulators are always a difficult area to address but experience has taught us that simulators of certain types are wholly inappropriate for training purposes and these include wooden wasters and nylon simulators. As a consequence, we have developed our own simulators in order that we may achieve the best compromise between safety and authenticity during lessons and practice for beginner and intermediate students alike. These are based on the bamboo shinai, having been significantly modified to mimic the generic characteristics of a steel sword, lacking only in the percussive elements. The basic student sword is a shinai adapted to accept a wooden or steel crossguard with a counterbalanced handle which is then recovered with the original leather sock. It possesses the correct balance and similar dynamic properties to that of a steel sword. It is significantly lighter to enable new students the opportunity to train without becoming too exhausted too quickly. The steel socketed training sword is a shinai that has been significantly modified to accept a steel socketed handle which is bound in leather. It possesses a steel crossguard and pommel and has the weight and dynamic characteristics of a steel sword lacking only in the percussive and perceptive nodes. This training sword is a good all-round compromise between safety and authenticity. 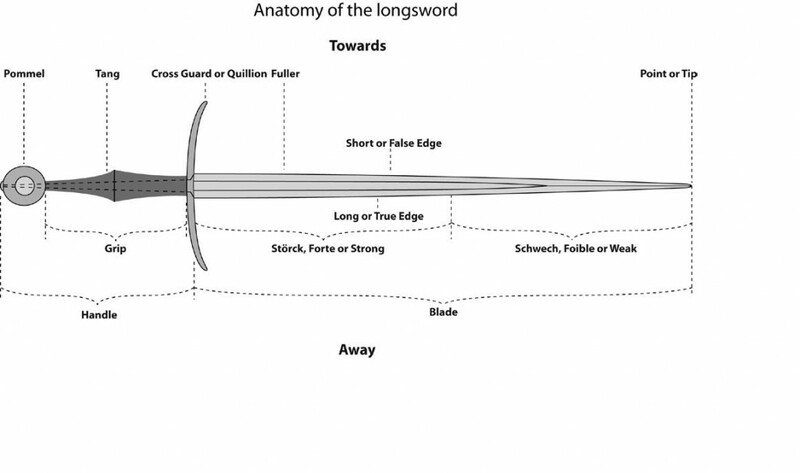 It can never replace the use of a steel sword for form work and controlled engagement but enables a student to use reasonable intent when applying the principles of Liechtenauer's system. Use of steel simulators are encouraged within the SMEF, mainly for form work and movement training, but there are so many bad examples available to the uninitiated that it is a minefield to find a good example. (I believe this also to have been the case during the medieval period, cost inhibiting availability only to the wealthy and the ruling classes, unless you were lucky enough to pick up a good example from the battlefield as spoils-of-war). A vast majority of the modern steel simulators available are designed for the re-enactment market and they are consequently heavy, unwieldy and massively inappropriate for martial training. The training steel swords we have developed are based on the generic proportions of swords from the late medieval period. They are specifically made for us and are hand finished in order to establish the correct characteristics for a sword of this period and type. The peined steel pommel tops a wooden handle that is shaped according to the user's preference (the example above having the bottle profile which guides and maintains the hand within the correct position of the grip) and is covered in leather. The steel cross guard tops the blade which is ground from a 3/8" billet of EN45 and makes the blade stiff and predictable. With a blunt 0.5mm edge and a 1/2 to 3/4 length fuller, these swords are as light as possible and easily controlled. The tip has a 'button' ground in during manufacture which reduces the possibility of accidental injury, but these swords are in no way safe to be used by the inexperienced or undisciplined and these training weapons have the same potential to inflict serious injury as if they were sharp. These are NOT re-enactment weapons and are specifically designed for martial training, only being used by experienced students within a controlled environment.